Desperate to keep the precious little water left in its reservoirs, the city of Wichita Falls may turn to an "evaporation suppressant" chemical for help. Desperate to keep the precious little water left in its reservoirs from evaporating, the city of Wichita Falls may turn to a chalk-like powder for help. City officials are hopeful that a biodegradable polymer approved by the Texas Commission on Environmental Quality could suppress lake water evaporation by up to 30 percent when it is applied to the lake's surface. If trial runs are successful, the City Council could decide whether to buy a 75-day summer supply that would cost about $400,000. While the logistics of spreading the powder over thousands of acres of water are still being worked out, Russell Schreiber, the city’s public works director, stressed that the chemical was safe and would not interfere with recreational activities at Lake Arrowhead — one of three reservoirs Wichita Falls relies on for water — where the trial would begin. “It’ll dissipate on top of the water and just form a clear kind of sheen,” Schreiber said. Wichita Falls' reservoirs have fallen to roughly 20 percent capacity since the drought began in 2010. Locals in the North Texas town of about 100,000 people have responded with unprecedented water conservation measures, including a ban on outdoor watering and pool refilling, plus surcharges for heavy water users. Combating natural water loss to evaporation is a new alternative for a city that is running out of options. During the unrelenting summer heat, the sun can sap more than twice as much water per day as all municipal users — about 100 million gallons, according to the Texas Water Development Board, which has predicted that Lake Arrowhead could dry up by November 2015. 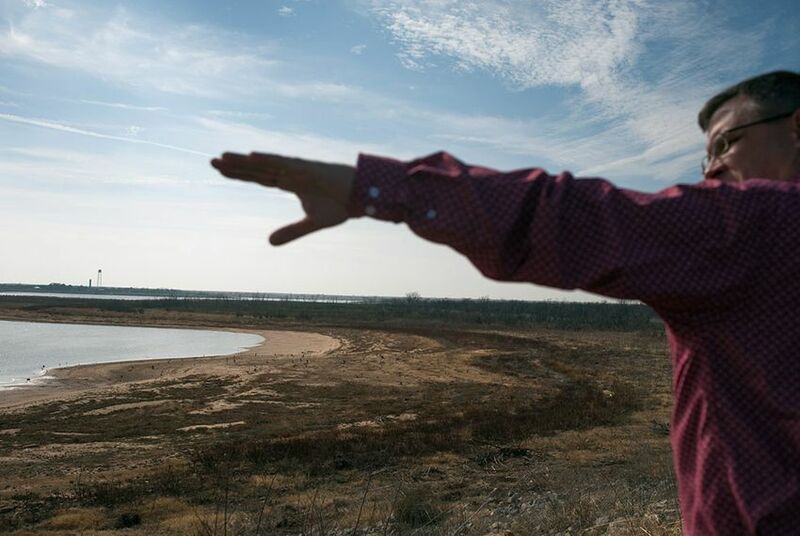 “We cannot conserve our way out of this drought,” Darron Leiker, Wichita Falls' city manager, said at a drought forum last week hosted by the Water Development Board and the National Oceanographic and Atmospheric Administration. That has forced locals to get creative, implementing a wastewater reuse system and investing $300,000 in cloud seeding to try to increase rainfall. Summer’s onset has lent a renewed sense of urgency to the situation. Rates of evaporation spike between July and August, when 100-degree weather can persist for weeks at a time. But the logistics of spreading the evaporation suppressing powder are challenging. Schreiber said the city would need to distribute about 5,000 pounds of it by boat every three days across the lake’s 6,000-acre surface. A recent test run proved unsuccessful when 40-mile-per-hour winds interfered with dispersal. Scientists at the drought forum warned that rising temperatures associated with climate change may hasten evaporation from surface water reservoirs in coming years.